Lightning struck a duplex in a 55+ community a few nights ago. Nobody was hurt, the electricity was out and a couple’s kitchen was destroyed — but thankfully, their spirits, kindness and sense of humor were still intact*. © 2011 by The York Daily Record/Sunday News. 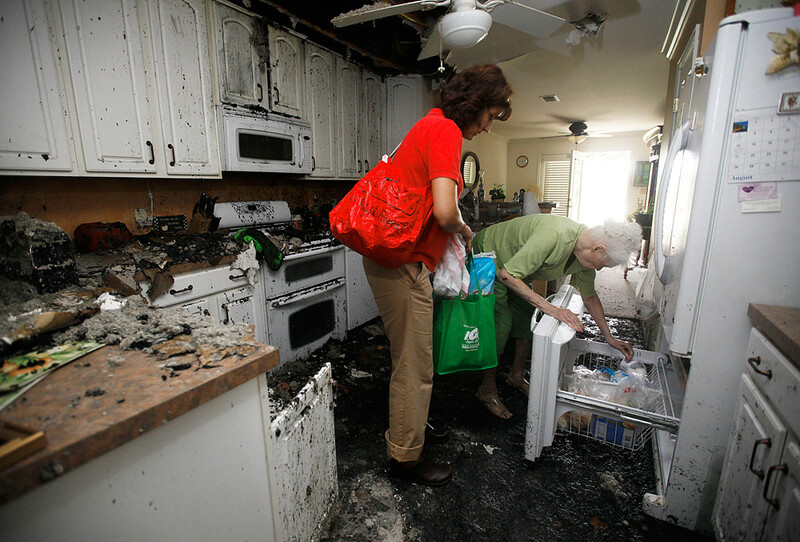 (Left to right) Mary Elliott of Windsor Township helps her mother Catherine Kowalczyk, 78, salvage the remnants of her freezer on Thursday, Sept. 15, 2011, the day after lightning struck Catherine and her husband Henry's home on the 300th block of Winners Circle, caused an electrical fire in the kitchen and displaced the couple from their home. The Kowalczyks, who will soon celebrate Henry's 80th birthday and their 56th anniversary, are currently displaced because of the damage in their kitchen. "See what happens when she cooks," Henry Kowalczyk joked, referring to his wife. There was no color treatment, but thanks? This is awesome. Great photo, Chris!